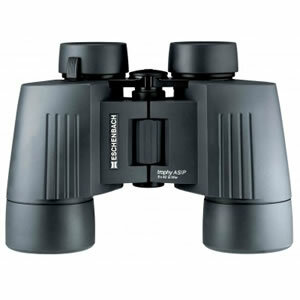 The Eschenbach Trophy high-performance waterproof sub-compact roof prism binoculars ideal for observing nature under any climatic conditions. They are nitrogen filled to prevent internal fogging. The design features a large focus wheel which allows the binocular to be used easily even with a gloved hand in cold conditions and also results in precise focusing adjustment at all times. 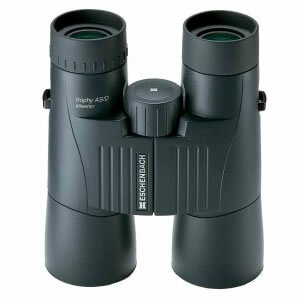 The Eschenbach optics are fully multicoated and Bak-4 glass is used in the prisms to ensure crisp contrast rich images that are combined with high colour fidelity  ideal for the discerning bird-watcher. Includes case and straps. 10 year guarantee. 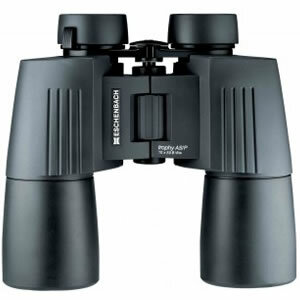 The Eschenbach range of optics are fully multicoated and Bak-4 glass is used in the prisms to ensure crisp contrast rich images that are combined with high colour fidelity  ideal for the discerning bird-watcher. Finally a wide angled all-weather porro prism binocular for spectacle wearers too! The unique Eschenbach dioptre adjustment design is particularly suitable for spectacle wearers as are the retractable rubber eyecups. The design blends superb Eschenbach optics with beautiful yet functional porro prism design. Among the outstanding features is an ergonomically designed focus wheel which allows the binocular to be used easily even with a gloved hand in cold conditions and also results in precise focusing adjustment at all times. The all-weather capability of the binoculars is assured by the waterproof construction and Nitrogen gas filling which prevents internal fogging when outside temperatures fluctuate. 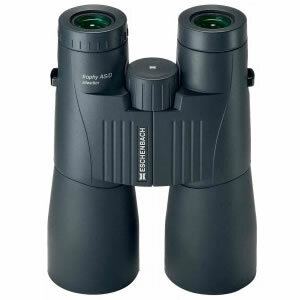 The Eschenbach trophy range of optics are fully multicoated and Bak-4 glass is used in the prisms to ensure crisp contrast rich images that combine high resolution with high colour fidelity  the ideal combination for the discerning bird-watcher or nature lover alike. 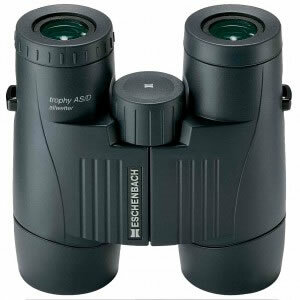 The design blends superb Eschenbach optics with beautiful yet functional porro prism design. 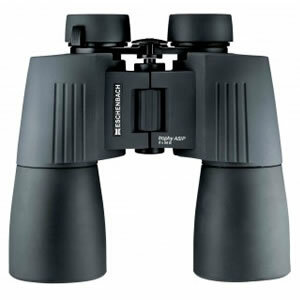 The 8x56 has optimum light transmission for the fully dilated human eye, so these binoculars are particularly suitable for low light observation, animals and birds at dawn and dusk or for the astronomy enthusiast. Among the outstanding features is an ergonomically designed focus wheel which allows the binocular to be used easily even with a gloved hand in cold conditions and also results in precise focusing adjustment at all times. The all-weather capability of the binoculars is assured by the waterproof construction and Nitrogen gas filling which prevents internal fogging when outside temperatures fluctuate.